The Museum of Science and Industry in Chicago is my all-time favorite museum. Ten years ago I lived in a suburb of Chicago, and I took advantage of the free museum days for Illinois residents and visited as many museums as I could. When we returned to Chicago for Thanksgiving, the Museum of Science and Industry was at the top of my must-see list. As the largest museum in the Western Hemisphere, the Museum of Science and Industry could entertain a family for several days. Seriously. We spent six hours there on our recent trip, and we didn’t even come close to seeing it all. You will need to pick and choose what you want to enjoy if you can only spare one day. You can explore the museum’s website for details about the many exhibits, Omnimax shows, and events. Prioritize what is most important for you to see and start there. If I were telling my best friend how to approach this massive museum, here are the exhibits I would tell her are on my must-see list for a family. This list is not comprehensive, so consider the interests and ages of those you are visiting with and pick your favorites. 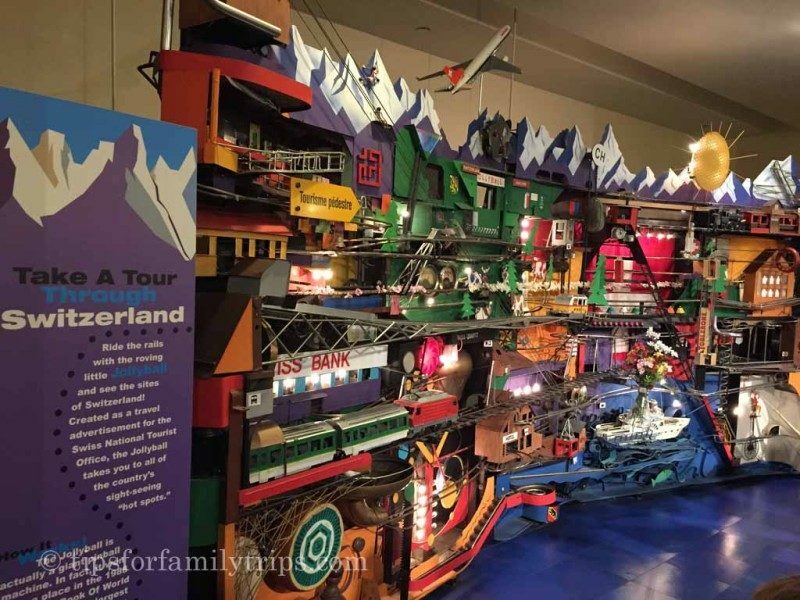 Kids of all ages will enjoy watching these model trains show the many things trains can do. In this exhibit, trains travel between Chicago and Seattle. Nearby are many trains that you can climb on and play with, and my boys loved this exhibit. The Idea Factory is geared for children under 8 and is a hands-on play area. On busy days, they admit people every 30 minutes on the hour and half hour. If you arrive about five minutes before that time, you should be able to get in and spend 30 minutes playing. There are many things to do, but my kids loved the Water Spectacle and moving balls through the pressurized air chamber. Don’t miss this exhibit that explores mathematical patterns repeated in nature and the world around us. The highlight of this exhibit is a Mirror Maze that was so fun to explore. My kids loved exploring and bumping into themselves in the mirror if they took a wrong turn! The exhibit ends with an interactive exhibit that explores patterns in the human body. Watch fertiziled eggs hatch before your eyes at the Genetics and Baby Chick Hatchery exhibit. See eggs shake, little beaks poke through, and newborn chicks take their first steps. One day years ago, my daughters and I sat for 45 minutes and watched a chick hatch completely out of its shell. It was a memorable highlight from the Museum of Science and Industry. We didn’t have time to do this tour on our recent trip, but I toured it years ago and would highly recommend this for anyone interested in learning more about life on a submarine. This sub was captured in 1944, and the 25-minute tour explores the days leading up to its capture. The tour is an additional expense, and the museum recommends advance online ticket purchases. No matter what you choose to see and do at the Museum of Science and Industry, here are a few tips to make your visit smooth and successful. As with all crowded museums, this museum is calmest the first 30-60 minutes of the day. You can avoid the ticket line by purchasing your tickets online. Decide what you want to see most and prioritize it. General admission tickets allow you access to most exhibits in the museum, but some special exhibits such as the U-505 Submarine tour and the Coal Mine are an additional expense and require a timed entry. Use this handy tool to help plan your day at the Museum of Science and Industry. The most popular events, even if they are free, require a time entry. Pick up your timed tickets early in the day from kiosks near the exhibits. Wait times get longer as the day goes on. Numbers in Nature: A Mirror Maze is free but requires a timed ticket. Don’t miss it! Since you will want to spend several hours at the Museum of Science and Industry, you will probably enjoy the food court. This time when we visited, we packed a picnic and ate it on the tables in the food court. Be sure to spend a few minutes enjoying the Swiss Jolly Ball–the largest pinball machine in the world. It’s quick and memorable. If you can visit during the holiday season, you will enjoy a stunning Christmas display of themed trees from around the world. The trees are each decorated with ornaments symbolic of different countries. I loved looking at each tree. When: 9:30-4:00 p.m. daily except Thanksgiving and Christmas. Some dates and most of the summer have extended hours until 5:30. Check the schedule here. The Museum of Science and Industry is included in the Chicago CityPASS. If you’re planning to visit other popular Chicago attractions, you could save up to 52% on admissions. Disclosure: We only promote destinations and products we have personally tried and genuinely recommend. My family received four complimentary tickets to the Museum of Science and Industry for the purpose of reviewing it on Tips for Family Trips. As always, all opinions here are my own. This post contains affiliate links. Clicking on affiliate links does not increase the price you pay, but helps us provide free content. Thank you for your support! What is the best pizza in Chicago? I love how interactive this museum is. And the chick hatchery. Chicago has a lot of amazing museums, but this one seems ideal for young families (though I’d never guess that by its name). You are right, Jody. This museum is great for young children. The farm equipment in the basement was my three-year-olds favorite part of the day. There truly is something for everyone there. Fun AND educational: a win-win!